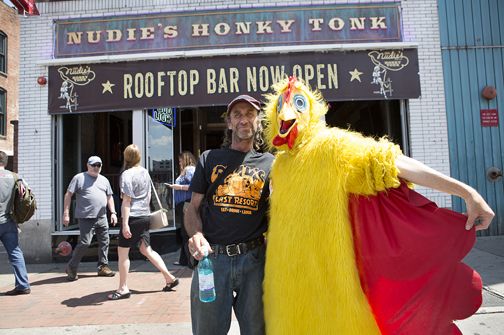 The Nashville Broadway Chicken, Melissa Burton, poses for a picture with friend Billy Miller of Murfreesboro. “When gas goes up, people stay closer to home,” says Kevin Triplett, commissioner of the Tennessee Department of Tourist Development. “We’re bordered by eight states. We already are a great driving destination, and that geographic blessing helps us whether gas is cheap or expensive. In Tennessee, Triplett’s sunny optimism is pretty much justified these days. At the state level, Triplett and his team marked National Travel and Tourism Week in early May by announcing record-setting growth. The state’s tourism industry, which the department says is responsible for $19.3 billion in spending, created 113.6 million person stays in 2017, a jump of 3.3 percent compared to 2016. This kept Tennessee in the top 10 travel destinations for the fourth consecutive year, and also keeps it at the forefront of retirees’ minds as they look for new homes, Triplett adds. The state continues to post varying degrees of positive visitor numbers in its major Metro areas, and work continues on efforts to tie in more rural areas to vacationers and their spending. Still, there have been enough lean years for officials to know that marketing, promotion and general drum-banging can never really stop, even in boom times. “We have to react to gas prices, to lodging rates and anything else that affects how, where and when people travel,” Triplett explains. “We do that at the state level, and also working with our partners all across the state. Even in a roaring economy there are only a certain number of travelers, and competition for them is always fierce. When an area does well, such as Nashville or the Great Smoky Mountains National Park, hotel rooms and restaurants follow. Then the onus is on state and local officials to keep them filled. It’s a relentless cycle, says Butch Spyridon, president and CEO of the Nashville Convention & Visitors Corp.
“You build your brand, then work on your brand awareness, and that’s followed by demand,” Spyridon says. “Then you need more rooms. Once those are there, you can market to a broader audience, which can lead to things like new air service and more people coming. “What we work to do is talk about how there are things happening all across the state,” Triplett says. “Over the last 18 months to two years, you’ve seen the Guest House at Graceland built, the largest hotel there in years, as well millions on the new Elvis Presley’s Memphis entertainment complex at Graceland. “Nashville is adding thousands of hotel rooms, not to mention restaurants and the huge investment being made at the Gaylord Opryland Resort & Convention Center with its water park. The Tennessean luxury hotel in Knoxville is opening, and Chattanooga is doing things like creating a long-term deal with the hugely popular Ironman competition that’s held there. The Collier family, celebrating its 50th year in the tourism industry, announced in early May it will invest $50 million into expanding its Sevier County businesses over the next decade. The family businesses employ more than 1,100 and are one of Sevier County’s largest employers, including Collier Development, Collier Restaurant Group, Smoky Mountain Resorts and Collier Wine Group. After catching his breath, Triplett is also quick to point out that Tennessee’s more rural areas, which account for the vast majority of the state’s 95 counties, aren’t being left behind. “If you’re driving from Memphis to Nashville, or Chattanooga to Knoxville or the Smokies, what’s there to do in between? “Our research shows that visitors want three things in their experience: authentic, genuine and real. That means they want to see what our big areas have to offer, but they also will go to a local restaurant or B&B tucked away off the beaten path. That means national and international marketing targeted to audiences who might want to hike the state’ 200+ miles of the Appalachian Trail, or float along its half a million acres of lakes or thousands of miles of rivers and streams. Outdoor enthusiasts are an evergreen tourism sector, Triplett points out, as are music-oriented travelers who already are aware of Tennessee and its cultural offerings in that regard. Hence the Tennessee Music Pathways project, which is planned for its debut later this year. Unlike trails which focus on specific points of interest within communities along their path, this project will highlight the towns themselves, Triplett says. “Part of our branding is that Tennessee is the ‘soundtrack of America,’ and that means music made in Tennessee, written, performed and recorded by Tennesseans,” he continues. “Memphis and Nashville are obvious, but every community in this state can come in on this as well. “You can hear great live music all across the state every day of the week, so when someone goes to Marshall County to learn about Grady Martin, or Crockett County to hear about Tommy Cogbill, and all the No. 1 hits and other records they played on, they can be tied into other communities who have other amazing musicians who they can then go and learn more about. Regardless of where visitors start or stop their Tennessee sojourn, chances are they wind up in Music City, which Spyridon says is responsible for around 30 percent of the state’s tourism earnings. 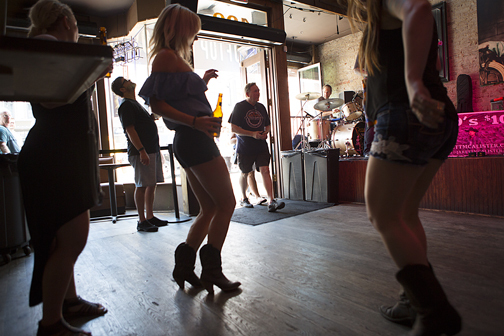 Tasha Lightheart, center, dances with her friends Lindsay Kila, left, and Felicia Davy at Nudie’s Honky Tonk on Broadway. They were visiting from Ontario. 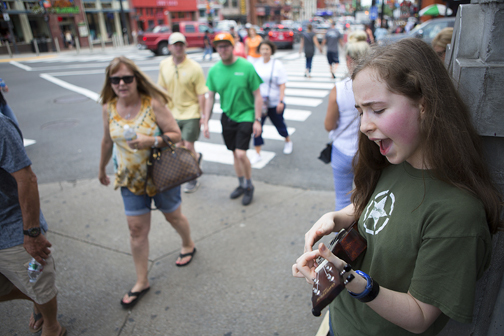 Nashville’s recent and ongoing growth in both tourists and new residents has led to a groundswell of interest in the already popular destination city, where the summer season starts with the CMA Music Festival, which last year generated $57.7 million in direct spending according to the NCVC. Nearby Bonnaroo, which brought in $37 million in economic activity, according to Coffee County officials, is another economic bonus in what’s expected to be a busy period. So, good times. But not cheap times for those looking to stay near the action. A big issue, especially for longtime CMA Festival visitors who still refer to the multi-day event as Fan Fair, is room cost. More visitors, be they conventioneers or bachelorettes, has put the squeeze on downtown like at no time in Nashville’s lodging history, but an influx of new lodging will help ease that — to a degree. “Right now, we have 29,000 rooms in Davidson County, so there’s been a little easing of that pressure on both occupancy and rates,” Spyridon notes. “But demand is still strong and still growing. “We have a report that shows us bookings, and right now 63 out of 92 days this summer are ahead of last year as far as prebooked rooms sold per day. Occupancy may go down in the coming months, but the number that matters to us is demand. Another reason room costs are unlikely to dive back to pre- “It City” levels is Nashville’s growing presence on the international travel scene. Spyridon explains this is the payoff time for decades of work by state and local tourism officials. The recent addition of a nonstop British Airways flight to and from London to Nashville International Airport is showing how strong the growth potential remains. That’s not to say domestic-born visitors are unwelcome, but foreign guests tend to stay longer — and spend more. “We will always benefit from U.S. drive markets, because we’re 250 miles or less away from a lot of the population,” Spyridon says. “But things like this flight coming highlight the fact that Tennessee is the fastest-growing international market, in terms of percentage of visitors. Nashville posted 14.5 million visitors in 2017, a jump of 4.6 percent over 2016. That’s a significant uptick from 2008’s 8.5 million visitors, but since only about 500,000 of them were from other countries, Spyridon sees that as a base, not a peak. He also says that the NCVC is returning to its roots as far as association marketing goes now that new hotels are both open and off the ground. Ensuring that the convention pipeline stays full also helps the NCVC maintain its marketing and operations budget, a portion of which is funded by the county’s hotel tax. These days the overall operating budget is around $29 million, an almost 30 percent jump from 2010 and far beyond the $15 million the entity set as a goal back in 2003. Other parts of the state also work on conventions alongside tourism because visitors equal spending, Triplett notes. Still, he says, success only puts a number on your back in a competitive industry. “People watch what you’re doing, and they all want your visitors,” Triplett acknowledges.